I don't even remember when I bought this sauce long ago, but it was stamped "Best by July 2015". I kept walking by it in the store going "Is that coffee flavoring or is that like some kind of funky sundae sauce?" Eventually I just gave in and threw it in the cart. I don't even remember when I first opened this, it was months ago, but I think the coloring threw me off more than anything. Why does it look like caramel if it's white chocolate? I didn't really get it then and I certainly don't get it now. When I actually tried the flavoring and I just didn't get it. So I let it sit.... for oh so long. I guess my point is that don't expect some magic white elixir to come pouring out of this fancy looking container. That said, if you've tried this or any other Torani flavor, let us know. Oh, and if I'm an idiot for putting this on ice cream instead of coffee, you can tell me that too. My boyfriend has purchased a lot of Torani syrups (mostly for coffee) and I'm never really thrilled with the quality. I prefer Monin. I bought a bottle a while back and I've tried it on several things. Ice cream, coffee, tea, random deserts etc. It's just not that good. I can't bring myself to finish it. I've heard the caramel one is pretty good, but I haven't had a chance to try it yet. I think it technically is supposed to be for coffee...having said that, I stir similar syrups into greek yogurt when I'm behaving & my Instagram feed is filled with me using ingredients not as intended. Not sure I'd like them for sundaes either. I think the white chocolate sauce my Froyo shop uses is Ghiradelli. I've used both Torani syrups and sauces in the past; their syrups have never really impressed me, and like someone else mentioned, I prefer Monin. Torani syrups just taste artificial and hardly ever represent what they're supposed to taste like. That being said, I love their sauces (which are thicker and are known for being mixed with coffee, but can absolutely be used as a topping for just about anything else). Admittedly, the one I consume most often is their caramel sauce which tastes even better than the caramel sauce Starbucks uses as a drizzle for their caramel macchiatos. Super sweet and delicious! The white chocolate one didn't impress me particularly, and their pumpkin pie sauce is a bit heavier on clove than I prefer, but other than their caramel I also demolish their peppermint bark syrup! 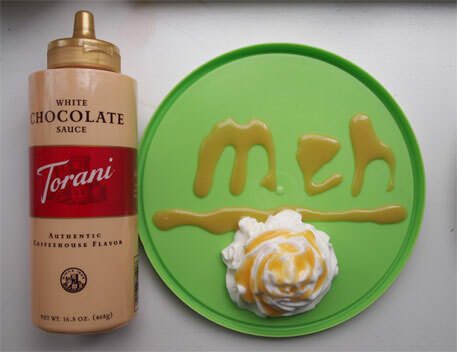 I've had the Torani chocolate sauce, and I was also not very impressed. I wound up using it to soup up hot chocolate and mix in hot coffee in the end. It didn't live up to my expectations on ice cream. Thanks for your comments everyone, I don't feel so bad now! Pretty much the same. Bought the chocolate expecting something great. Can't say it's that much different than a thicker Hershey's. Not worth the price premium. I used to work at a coffee shop that used this for lattes. I was never impressed with the flavor of it though. Just seems like a pointless way to add more sugar. Nothing special here. last anon, what do you mean exactly? Yes it's past the best by date, but when I originally opened it months ago, it looked pretty much the same.